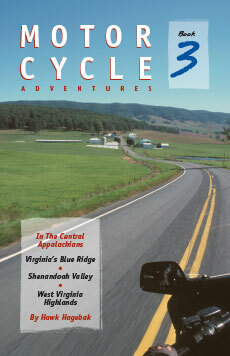 Nothing could be finer than riding in the North Carolina mountains—and southwest Virginia, and East Tennessee. 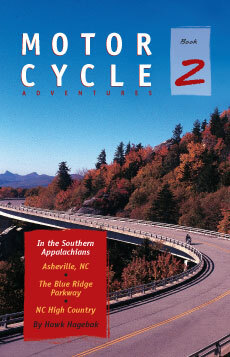 Hawk Hagebak’s second motorcycle adventure guide takes you along winding backroads in the NC High Country, through the world’s shortest tunnel at Tennessee’s Backbone Rock, and from the Asheville, “Paris of the South,” to the mile-high wonders of the Blue Ridge Parkway. This guide includes 26 rides in all, from 16 to 144 miles. 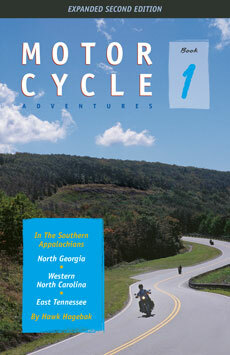 Sample the culinary delights of the region, visit motorcycle-only resorts, and take advantage of this book’s complete directions, easy to read maps, road conditions, motorcycle laws for the Southeastern states, and more—all liberally sprinkled with the author’s special brand of humor and practical advice.